Industrial accidents were all too common during the first half of the 20th century, and the Solvay Process Company had perhaps more than its share because that was the nature of chemical companies. The 1929 explosion at a Solvay Process facility at the northeast edge of the village was the company's worst since the horrific 1918 explosion at the Semet-Solvay plant in Split Rock. That accident, one of the worst disasters in Central New York history, claimed at least 50 lives — the exact number varies slightly from story to story. One life was lost during the 1929 explosion, and that victim's story, which is told below, is particularly heartbreaking. Those injured recovered, though the lives of some, I'm sure, were forever changed. 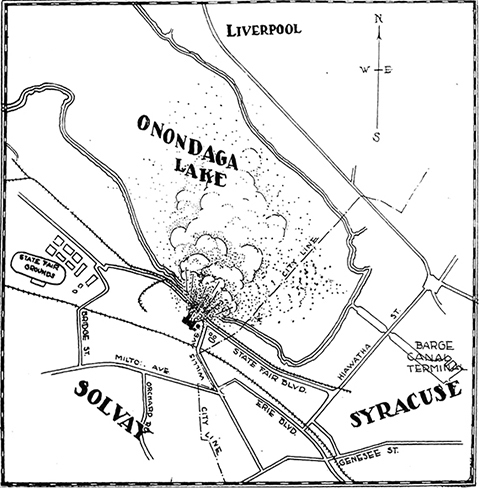 Above: A Syracuse Journal map showing the location of the explosion and how clouds of gas moved over Onondaga Lake toward Liverpool. Explosion of a tank of chlorine gas in the chlorine plant of the Solvay Process Company in State Fair Boulevard near the end of Willis Avenue early this morning claimed one victim early this afternoon. James Carlisle, 30, of 131 Hudson Street, a workman, died in Syracuse Memorial Hospital as a result of having inhaled a large quantity of the gas. One other worker, Charles Nye of 307 Herkimer Street, is in Hospital of the Good Shepherd in a serious condition. Thirteen others were overcome and a score more workers and the residents of Liverpool were endangered by the deadly gas. The 13 other employees at the chlorine plant who were overcome were treated at the first aid station by Dr. R. W. Chaffee, Solvay plant physician, and sent to their homes. Solvay officials early this morning began investigation of the explosion. At noon today I. V. Maurer, manager of operations, and his assistant, G. A. Milligan, announced that they had been unable to determine the cause. Both officials sought to minimize the danger from the accident and said that the financial loss would be nominal. Carlisle was found unconscious in the yard in front of the plant by rescuers, who donned gas masks to make a hurried trip through the plant property in search of workmen. Carlisle apparently fell while fleeing with a score of others from the immediate vicinity of the damaged tank. Nye was also found unconscious. He had managed to reach a point farther from the tank than Carlisle and apparently inhaled considerably less of the gas. Syracuse police held grave fears for the safety of residents of Liverpool when they received a report of the explosion. Captain Peter P. Naumann, who relieved Captain Edward Smith,, the first to receive the report of the explosion, notified state police and deputy sheriffs. Troopers detailed from North Syracuse under Sergeant Peterson and deputies from the county jail went to Liverpool and warned residents to be prepared to leave their homes. A brisk southeast wind accounted for the danger to Liverpool. The poisonous gas was carried across State Fair Boulevard and out across Onondaga Lake in the direction of the village by the wind. Syracuse police feared the chlorine would not lose sufficient of its strength to be without danger when it reached Liverpool. Early this morning the odor of the gas could easily be detected in Liverpool. Some of it had been carried to that village by the wind as police feared. “The tank contained only about one ton, or 25 cubic feet of chlorine gas,” said I. V. Maurer. “The financial loss is nominal, consisting largely of a wooden shed that covered the tank and the steel tank itself. Captain Smith received a report of the explosion from police at the Solvay plant at 3:05 a.m. He immediately sent patrolman Leo Handwright to the city line on State Fair Boulevard, with instructions to stop all vehicles and pedestrians from getting near the scene of the explosion. Solvay police were stationed near the Halcomb Steel Company plant, north of the chlorine plant, and acted under similar orders. For several minutes after the tank broke it was impossible to get within 100 yards of the scene without a gas mask. For more than an hour after the blast and the thousands of cubic feet of the deadly gas was released, the gas hung like a green pall over the surrounding territory. Patrolman Handwright narrowly escaped being overcome, although he was stationed several hundred yards from the scene of the explosion. He was forced to flee from the immediate vicinity until some of the gas drifted away across Onondaga Lake. Although a score of special patrolmen from the Solvay plant kept a careful guard about the property this morning, admitting no one but officials of the company, it could be seen from a distance that at least one small building in the group that makes up the chlorine plant was destroyed. Its wreckage could be seen between giant tanks containing similar gas. Although Solvay Process officials said there was no audible explosion when the tank let go, residents of the village of Solvay called police headquarters soon after to inquire about an “explosion.” Police here said the tank let go with a roar that could be heard throughout the village of Solvay. Workmen at the chlorine plant fled immediately after they hear the blast. Experienced employees knew the deadly nature of the chlorine, but although all of them were in the open a few seconds afterward, more than a score were felled as they ran for their lives. Most of them were able to get out of the plant yard before collapsing. The gas is similar to the deadly gas used in the World War. Had the wind been blowing from the northwest, the entire village of Solvay would have been in grave danger. Patrolman Handwright, who, with Sergeant Justin McCarthy, reached the scene a few minutes after the blast, said it was impossible to see State Fair Boulevard within several hundred yards of the chlorine plant. Ten weeks ago James Carlisle, 30, of 131 Hudson Street, realized an ambition he had held for the last five years. He met his wife and daughter, Peggy, 11, at New York Harbor, where they arrived from Belfast, Ireland. Carlisle’s five-year struggle to earn enough money to bring them to this country was realized and the little family was happy. Today the happiness is shattered and the dream of a home with his wife and daughter will never come true for the husband and father who died in Memorial Hospital, his lungs seared by deadly chlorine gas which exploded early this morning in the plant of the Solvay Process Company, where he was employed. Mrs. Carlisle, who has no relatives in this country, waited in an adjoining room for the latest developments in her husband’s condition, waiting eagerly for the word of nurse and doctor. Awakened at 3 o’clock this morning, shortly after the disaster occurred at the Solvay plant, Mrs. Carlisle went to the hospital. Since that time she remained near her husband at the hospital while doctors listened to his labored efforts to get enough oxygen to prolong life. In the meantime Peggy, 11, remained with neighbors, wondering where her mother and father were, and when they would be home. She played with a large doll she said her father had sent to her in Ireland three years ago, unmindful that he was fighting for his life at the hospital. Carlisle, it was reported, formerly lived in St. Louis, but moved to Syracuse two years ago, securing employment with the Solvay Process Company. He had left for work as usual last night and, though he always worked near the fatal chlorine gas, felt no fear, little thinking that within hours the entire Solvay section would be threatened with a gas attack as dread as those in the trenches during the World War. Neighbors of the Carlisles today declared they will care for his wife and child. The dangers of war, the bombardments, the rifle fire and the gas attacks — all these James Carlisle, 30, of 131 Hudson Street, had faced without tremor and had survived. Four grisly years of it. Day after day of constant danger from any one of the war-time implements of destruction as a soldier in the service of King George. Yet Private Carlisle emerged from the service unmarked and unscathed. Then came the Armistice and the reunion with “the girl he had left behind” in Belfast; marriage; the baby; the struggle for existence; the decision to come to America; the successful fight for life in a new mother country; another struggle for reunion with his wife and child. Success. 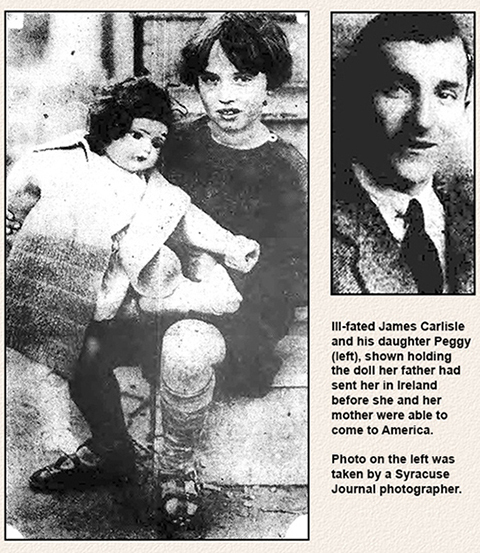 At least, here in Syracuse, the little Irish family found the contentment and peace th husband and father had been seeking for 15 years, since the outbreak of the World War. Fifteen years, almost to the day, after he had enlisted in his majesty’s service, a peace-time catastrophe such as he had daily encountered during the war, claimed James Carlisle’s life. He died as the result of chlorine gas poisoning, gas he had inhaled in the explosion of a tank in the Solvay Process Company plant early yesterday morning. The implements of destruction he had so successful frustrated during his period of service on land and on sea in the service of the British government transport corps, were not to be denied yesterday, and former Private J. Carlisle, honorably discharged from the army 10 years ago, went to an industrial soldier’s death in Syracuse Memorial Hospital. He is survived by his wife, Margaret, and a daughter, Peggy, 7, who arrived in this country but 10 weeks ago from Belfast, Ireland, to join him here after a long tangle in the governmental immigration red tape. He also is survived by his parents, Mr. and Mrs. William Carlisle of Belfast; a sister, Mrs. Neta Estridge of St. Louis, and five brothers, Glenara, Matthew, William, Thomas and Samuel Carlisle, all of Belfast. Funeral services will be conducted in the undertaking rooms of Cornell & Clement Monday at 2:30 p.m., with Rev. William M. Hydon of West Genesee Methodist Episcopal Church officiating. Residents of Liverpool escaped the horrors of chlorine gas poisoning as a result of this morning’s Solvay gas tank blast only by the alkali nature of Onondaga Lake, Professor Louis C. Jordy of the Syracuse University chemistry department declared today. Although chlorine gas carries its deadly effects for little more than a mile over land, it will travel for more than double that distance over war, Professor Jordy explained. He explained that any alkali substance would have a counteracting influence on the gas. “During the war,” he said, “the only means the Americans could find to fight off the German chlorine gas attack was to soak pads in baking soda or any other kind of alkali and apply them to their mouth and nostrils until the gas had passed over them. In discussing the properties of chlorine gas, the professor explained that it is made by passing an electric current through brine water. This process produces chlorine, hydrogen and caustic soda. Chlorine gas was first used in the war on April 22, 1915, he said, by the German army in an attack on a sector of British soldiers. the gas wiped out the majority of troops in the sector, tearing a gap more than four miles wide in the line. “Although the victim does not die as torturous a death as was painted during the war, chlorine gas produces a terrifying effect on its victims,” he said. “The gas irritates the nose and lungs in much the same manner as an attack of pneumonia. It produces violent coughing fits during which the victim often suffocates,” he explained. According to Professor Jordy, the gas is usually stored in liquid form under high air pressure. When exposed to ordinary atmospheric conditions, the liquid evaporates into a green gas, forming many times its liquid amount in fumes. He said that an ordinary tank, such as those at the Solvay plant, contained far more gas than was ordinarily used in a gas attack during the World War. Fourteen New York Central section hands sleeping in three camp cars in the Solvay yards back of the Chlorine Plant of the Solvay Process Company narrowly escaped being overcome when the chlorine gas tank exploded yesterday morning, it was revealed today. One Solvay plant worker is dead, another is in serious condition in Hospital of the Good Shepherd, and many others were overcome or endangered by the deadly chlorine. The fact the wind was blowing from the southeast and carried the gas across Onondaga Lake toward the village of Liverpool probably saved the lives of all the chlorine plant workers and the New York Central section hands. The danger to the section hands was greater than to the workers in the plant because none of them knew the reason for the unusual odor after the blast or that deadly gas had been released. According to the section hands, none of the Solvay officials warned them after the blast. In a letter to The Journal, members of the section described their experiences. “We read in your paper this evening about the explosion. We find you have overlooked 14 more men who were sleeping in three camp cars about 500 feet away on the New York Central property. “We were awakened by the odor of chlorine gas, but we knew nothing of the danger we were in. We stayed in our cars coughing and choking, and even bleeding from our mouths until we could stand it no longer. “We staggered from the cars into the mist of the gas looking for fresh air. We became lost in the railroad yards seeking relief. None of the Solvay Process Company’s employees gave us any warning whatsoever of the danger we were in. “The foreman sent an officer over to the camp cars to see if we were still alive after having overlooked us for some time. The cats that were in the camp were so affected that the officer had to shoot them. With one of the Solvay workers, James Carlisle, 30, of 132 Hudson Street, dead as a result of the explosion, another, Charles Nye, 39, of 207 Herkimer Street, is battling for his life in the Hospital of the Good Shepherd. He inhaled a large quantity of the gas and is in a serious condition. A statewide investigation of the menace to public life and health as the result of increased use of chemicals in industry brought sharply to public and official attention by the chlorine explosion at the Solvay Process Company here and the hospital catastrophe at Cleveland was promised by Miss Frances Perkins, state commissioner of labor, who is here today to probe the Solvay blast. Commissioner Perkins said she has directed the Labor Department chemical engineer, William J. Burke, to prepare plans to conduct an extensive survey into all branches of industry with object of reducing the apparent menace, not only to workers, but to the general public. She said the object of the probe will be to draw up a new safety code. Early this afternoon Commissioner Perkins visited the Solvay plant where she conferred with Carl Sundstrum,, chemical engineer. She was shown the place where storage tanks exploded on May 10, releasing 20 tons of liquid chlorine and resulting in death of one worker and 14 others being overcome. “The explosion here at the Solvay plant, coupled with the disaster at Cleveland and another explosion recently in Brooklyn, awakened us to the increasing menace in use of chemistry in industry,” said Commissioner Perkins, who added that a survey was being prepared earlier, but that these accidents have speeded up the process. “The Solvay Process Company is forced to use the type of storage tanks it does by orders of the Interstate Commerce Commission. the iron tanks are specified for chlorine storage and transportation. “Mr. 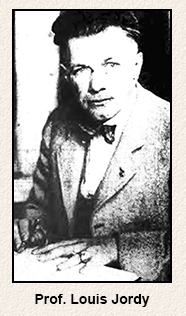 Burke’s theory indicate the formation of ferrous salts on the inside of the tank set up the chemical process which resulted in formation of the low chlorine oxide and the resultant explosion. “Solvay Process officials are doing everything possible to co-operate land will set up similar conditions to test the theory. I understand these experiments cannot be conducted for about 10 days. Mr. Burke today is conferring with Interstate Commerce Commission experts to determine why they specify iron tanks. The Cleveland Clinic fire referred to in the above story was an unbelievable disaster, one of the country's worst. The fire started on May 15, 1929 in the basement of the hospital and was caused by nitrocellulose x-ray film that ignited when an exposed light bulb was too close to the film, causing poisonings and two separate explosions. The fire claimed 123 lives, including that of one of the founders, Dr. John Phillips. Policeman Ernest Staab was killed by the gas while rescuing 21 victims. The Brooklyn incident mentioned was an April explosion in the classroom of a Brooklyn High School chemistry teacher. Windows were shattered, but fortunately there were no deaths and the resulting fire was quickly extinguished. The cause was a chemical reaction in bottles that held a sodium compound. The school's 3,200 students were evacuated, but soon returned and classes resumed. Despite the flurry of activity after the explosion, the investigations didn't generate enough interest to warrant a follow-up in the Syracuse Journal. The Solvay Process Company and its affiliate, Semet-Solvay, made safety a priority, but working with chemicals continued to be a risky business. Investigation of a report that two men were overcome by chlorine gas when the circulation pump to the liquefier burst at the Willis Avenue plant of the Solvay Process Company last Monday is being carried on by officials of the State Labor Bureau. The two men overcome, according to the investigators, were Robert Jacobs and Robert Truaz. Both required medical treatment after the explosion. This is the second chloride explosion at the plant this year, the first resulting in death to one man and injury to many others. • 1916: Deadly preview of an even great tragedy.